The video clips below are frame-accurate video timecode displays which can be downloaded and used with your video project to provide a timecode reference. 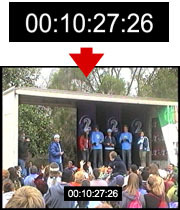 The timecode clips are 160x40 pixels and can be placed anywhere in your video frame, as per the example on the right. Choose the correct format to suit your project from the list below. These are big files — you might want to download the 1-minute version first to make sure it works. Windows video files use the Microsoft Video 1 codec. Quicktime/MP4 files use the H.264 codec. MPEG2 files have the extension .m2v. If your editor doesn't recognise it, try changing the extension to .mpg. If the timecode looks squashed or stretched in your project, try changing the pixel aspect ratio of the timecode clip. You can also resize it if you wish. These timecode files are for marking individual frames as per video editing conventions. If you're looking for a clock that shows times in 1/100 second increments, see our clock timecodes. If you have any problems or comments about these files please let us know. IMPORTANT: Once you are satisfied that the file will work for you, please consider donating a few dollars to help pay for the download. Donations are handled by Paypal — click the button on the right to continue (a new window will open). Thanks!